The event which all Bollywood figures and film buffs look forward to every year finally took place on Sunday night! 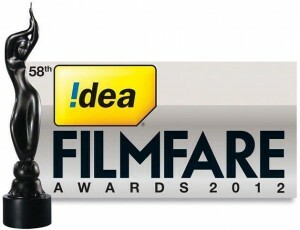 The 58th Idea Filmfare Awards was held at Yash Raj Films Studios in Mumbai, which saw the film fraternity unite to celebrate the best of Hindi Cinema during 2012. Considered by many to be Bollywood’s equivalent to the Oscars, this year’s Filmfare awards are extra special since 2013 marks 100 years since the first moving picture was made in India. There were a number of films which thoroughly deserved the awards for delivering outstanding entertainment which will be remembered for years to come. These include Vicky Donor, Kahaani, Gangs of Wasseypur and Barfi! . Filmfare also paid tribute to the late Yash Chopra who sadly passed away on October 2012. The great auteur was posthumously awarded the Lifetime Achievement Award for his phenomenal contributions towards Indian Cinema. Given that this year is the centenary year, many will agree that he was the perfect choice to be bestowed with this honour. The awards ceremony was hosted by Shah Rukh Khan and Saif Ali Khan, who apparently delivered some crowd-pleasing entertainment. There were some awesome stage performances also from actors such as Anushka Sharma, Hrithik Roshan and the cast of Student of the Year, Varun Dhawan, Siddharth Malhotra and Alia Bhatt. Overall, it was apparently one unforgettable event which celebrated the best of Hindi Cinema in style! You can catch all the highlights of this year’s Filmfare Awards on television when it airs next month. Below is a full list of winners if you cannot wait until next month to find out! Best Actor (Male): Ranbir Kapoor – Barfi! Best Debut (Female): Ileana D’Cruz – Barfi! Sony Trendsetter of the Year: Barfi! Best Production Design: Rajat Podar – Barfi!